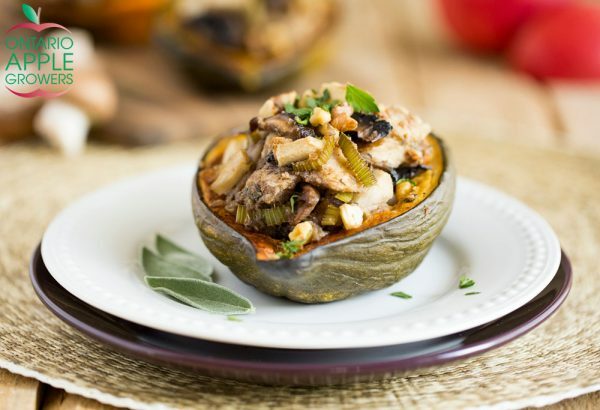 These savoury Mushroom, Apple, and Walnut Stuffed Acorn Squash are an easy accompaniment to a festive meal or casual weeknight dinner. The meaty mushrooms add beautiful texture to the stuffing, while the apples add a layer of tartness and bite. It’s very veg-friendly and can be adapted to accommodate completely plant-based guests! Cut acorn squash in half lengthwise. Remove the seeds. Season the inside with salt and pepper. Place cut side down on a baking sheet lined with parchment. Bake about 30 minutes or until soft. Meanwhile, in a large sauce pan heat olive oil. Add mushrooms and sauté for 3-4 minutes. Add celery and continue to sauté for 5 minutes. Lower heat and add apples. Continue to cook until apples become tender, about 5 minutes. To the pan add butter, sage, and vegetable stock. Heat just until butter is melted. Remove from heat and allow to cool. Place chopped walnuts and diced bread in a large bowl. Pour warm vegetable stock mixture over bread. Using your hands toss the bread until it is well coated and most of stock is absorbed. Remove squash from oven and turn it cut side up. 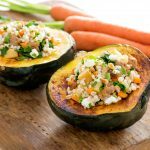 Divide the stuffing among each squash half; spoon the stuffing into the cavity of each squash until filled. Return to 350°F/175°C oven and bake until stuffing is golden brown, approximately 15-20 minutes. 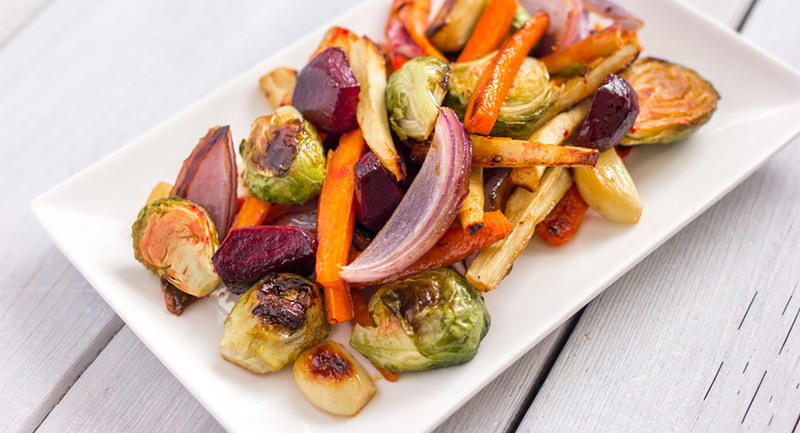 Serve hot alongside a festive ham or weeknight roast chicken. *Use Ontario Idared, Golden Delicious, Honeycrisp, or Empire apples.